One last shot at a CM5 concert and intensive summer improvisation fun before fall and winter beset us, folks. After five diverse and successful 2012 concerts (we saw them all, we get to judge) we’ve saved our most august and experienced crew for last. When a series of WPRK-FM concerts metamorphosed into the Civic Minded 5, a list of wannado artists of all stripes and varying degrees of obscuro-music fame emerged. On the more obscuro side was English pianist Veryan Weston; Cecil Taylor-ish pointillism fluidly merged with modern European classicalism. A few CM5ers have witnessed the diversity inherent in Trevor Watts’ delivery as a wind player in the boldly experimental London Jazz Composers Orchestra and the leader of his lilting, jazz-fused, African percussion-arrayed Moire Music Drum Orchestra. While an English duo composed of saxophone and piano doesn’t immediately bring finger-snapping, suburban Bohemianism to Central Floridians, we offer a far deeper affair. Watts and Weston remind us of the heartening emotionalism fused with the Cinemascope widening of the possibilities that emboldened the inhabitants of the 1960’s artist. Fast-forward to 2012, adding on decades of experiential episodes, Trevor Watts and Veryan Weston offer both their past and present. After growing up in a jazz-loving household and passing through a band in Her Majesty’s Royal Air Force, Trevor Watts split himself into a saxophonist in the famous nascent Brit blues scene of London’s Marquee Club, playing with Sonny Boy Williamson and Long John Baldry and the New Thing experimentalism by joining the Spontaneous Music Ensemble (SME) while starting his own Amalgam outfit. While SME and Amalgam were highly influenced by the American emergence of free jazz, they added a pan-continental palette of styles, including European musical angles uncommon from their Stateside cohorts. Watts expanded his African influences through a series of partnerships at the outset of the 1980’s- a member of South African expat drummer Louis Moholo’s group, founding his Moire Music Orchestra (with pianist Weston onboard) and then his Drum Orchestra, featuring a phalanx of percussionists. By 1990, the two group ideas moved to the center in combination while favoring the African percussion sphere of his work. Watts went above ground, adding to his extensive discography, when ECM Records released his Moire Music Drum Orchestra’s A Wider Embrace in 1994. His duo partnership with Veryan Weston was first documented when London’s Emanem Records– one of the world’s most rigorous and verdant improvisational outlets – via their 6 Dialogues CD. 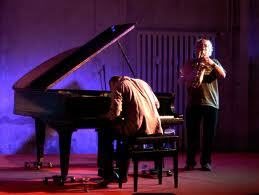 Veryan Weston moved his probing pianism and compositional devices to London starting in 1972. He became a member of the punk-sounding, but jazz-based Stinky Winkles and composed music for a work by iconic filmmaker Derek Jarman. Weston continued a track away from mainstream influence at the outset of the 1980’s by playing in a quartet with drummer/percussionist Eddie Prevost of AMM fame (noted for inspiring Pink Floyd’s soundscape/timbral non-songs that they presented in 1967 concerts and happenings) and sometimes quizzical, uncompromising artists such as sound poet Phil Minton and saxophonist Lol Coxhill. In addition to playing piano, Veryan Weston is known for playing church organs as creative music instruments and composing for voice, chorus and texts, including music for 25 voices and a suitably experimental take on the text of James Joyce’s Finnegans Wake. Weston’s diversity is borne out with a study of his discography. The duo’s six date U.S. tour includes the high-flying, rising star Timucua white house, supporting 5 More Dialogues, a 2 CD offering from Emanen. Visit our Facebook page for more examples and related CM5-centric web-isms. Tags: Civic Minded 5, cm5, Emanem, Spontaneous Music Ensemble, Timucua Arts Foundation, Timucua white house, Trevor Watts, Veryan Weston. Bookmark the permalink. Thanks for linking to my Airtran piece!